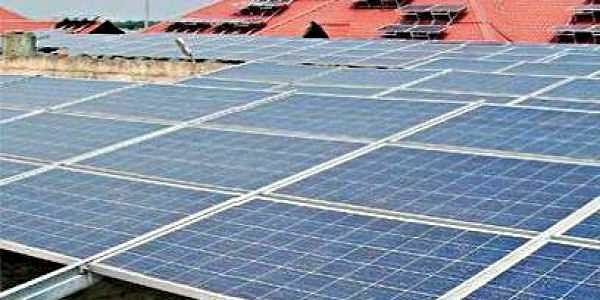 KOCHI: The Cochin International Airport Ltd (CIAL), which has taken the lead in utilising renewable energy in the aviation sector by becoming the first fully solar-powered airport in the country, is aiming to optimise its renewable energy capabilities to a record level of 40 MV by March. The airport company, which at present has an installed capacity to generate 29.3 MW solar power, has awarded Indian EPC contractor Sterling and Wilson a contract to develop a 9.9-MW solar photovoltaic (PV) project for the Cochin International Airport. The company will complete the work on the proposed 9.9-MW solar PV project by March, said CIAL spokesperson. According to the CIAL authorities, the airport had last year opened a state-of-the-art new international terminal for passengers and the renovation of the old domestic terminal is progressing for utilising it for other commercial purposes. So, the airport requires more solar power to make new extensions and other infrastructure facilities functional. Once the installed capacity of the solar power system is upgraded to 40 MW, it will be able to generate around 1.6 lakh units of power per day, against its daily requirement of 1.2-1.3 lakh units, said CIAL authorities. Sterling and Wilson will set up a 7.5-MW ground-mounted plant for airport facilities and a 2.4-MW rooftop carport array. The new 2.4-MW rooftop carport array will be located in front of the domestic terminal. The airport company has already developed a solar car park with solar panels having fitted on the rooftop of the car bay in front of the international terminal which has an installed capacity of 2.5 MW. The new 7.5 MW ground-mounted solar capacity will be installed at five different locations of the airport, while the solar carport array will be completed in six months, according to the company which won the contract. The total value of the 9.9-MW project, estimated by CIAL Infrastructures, stands at `510 million. It is also important for the CIAL to upgrade its installed capacity of solar power generation at regular intervals in tune with the extension of its infrastructure facilities to keep the tag of the fully solar-powered airport. CIAL is the fourth largest international airport in the country in terms of handling international passengers. The CIAL has handled 89,41,198 passengers during 2016-17, maintaining the status-quo of being the fourth in terms of international passengers and seventh in terms of total passengers, in the country. The airport has witnessed a 15.06 per cent increase in passenger traffic during 2016-2017. The domestic sector alone witnessed an increase of 26 per cent in passenger traffic as compared to last year. With 49.98 lakh passenger movement in the international sector and 39.42 lakh passengers in the domestic sector, CIAL continues to be the only airport in the state which handles more than 5 million passengers a year.